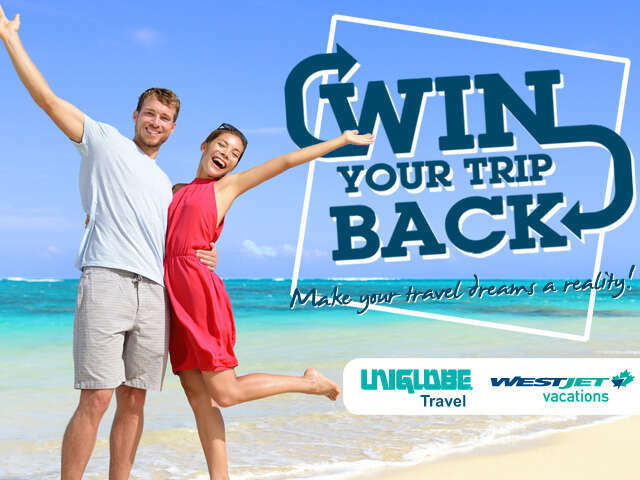 Imagine, winning the cost of your trip back simply because you've travelled with UNIGLOBE Travel! What's the Prize? The Win Your Trip Back prize is up to a maximum value of $2,000 CDN per person or up to a maximum value of $4,000 CDN per booking. The amount of reimbursement corresponds to the amount of the package at the date of reservation and the maximum amount that will be reimbursed is four thousand dollars CDN ($4,000) per booking. Who Can Enter? Contest is open to all Canadian residents 18 years of age or older, except for employees of UNIGLOBE Travel and the immediate family of members of such people who reside in the same household. How to Enter? All entries have an equal chance of winning. One entry per booking. No purchase necessary. To be entered automatically into the contest, the contestant must purchase a WestJet Vacations package between November 16, 2017 and December 15, 2017. To be entered manually, contestant must submit a 500 word essay on their favourite vacation memory in order to qualify. Submissions must be made by email and sent to info@uniglobewc.com. Each winner of the contest must sign a standard contest prize acknowledgement and release form before any prize will be awarded. Not combinable with any other offers or promotions. Winner must reside in Canada and must be 18 years or older. Maximum value of the Win Your Trip Back draw is $4,000 CDN. Prize will be awarded after travel takes place. In the event of trip cancellation the prize becomes null and void. No cash value if trip cost does not exceed maximum prize allowance. Prize winner must consent to UNIGLOBE Travel publishing or announcing their name, city of residence and photograph for publicity purposes without payment or compensation. Participants automatically accept these rules and release by UNIGLOBE Travel from any liability with respect to redemption of the prize. UNIGLOBE Travel reserves the right to withhold the prize or disqualify the prize winner's entry with the selected entrants and at UNIGLOBE Travel's own initiative. Compliance with Contest Rules: All contestants agree to abide by the Contest Rules, which are subject to change at the sole discretion of UNIGLOBE Travel.